When you’re preparing for a local, long distance or international move anywhere in the U.S., make sure you call an agent of Stevens Worldwide Van Lines. 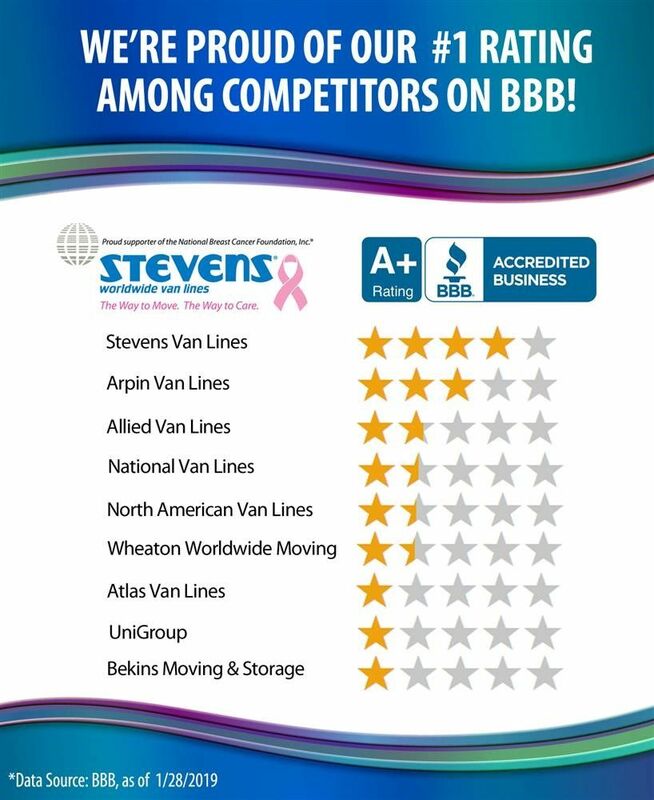 The Better Business Bureau has just updated their list of top rated national moving brands on April 23, 2018, and Stevens is again rated as the highest rated national moving brand in the country! Stevens has been a national van lines company since 1905, so it’s no wonder that they have an overall rating of 4.66/5 stars with the BBB. That’s why we here at Cousins USA Moving & Storage are proud to be an agent of Stevens, a moving company that puts customers first. With Stevens, you can have peace of mind knowing that your move is being handled by professionals and that every out-of-state move helps to benefit the fight against breast cancer. For your next residential or commercial move, be sure to call Stevens. If you’re looking for a reliable Stevens moving agent in South Florida, you can get a free quote from us by filling out our online form.